This was one of the best years I have had chasing Red Fish in the Grass. On most trips we saw dozens and dozens of tails, with no or little competition. Now it is on to low tide winter fishing. Again this year I am hosting a trip to Ascension Bay fly fishing for bonefish, permit, tarpon, and other species. This is an all inclusive trip. You fly into and out of Cancun. We have a private bus for transfer to Punta Allen. The trip is amazingly affordable. I have a few spaces left. Let me know if you would like to spend a week in Paradise in mid-February. Here is a link to some more photos: Fly Fishing Ascension Bay. That says it all. We saw minimum 10 tails on a trip and as many as 75 on really good days. Accurate casts were rewarded with fish from 7 to 11 pounds. This was in September, Oct and early November. Enjoy the pics from the last few months. 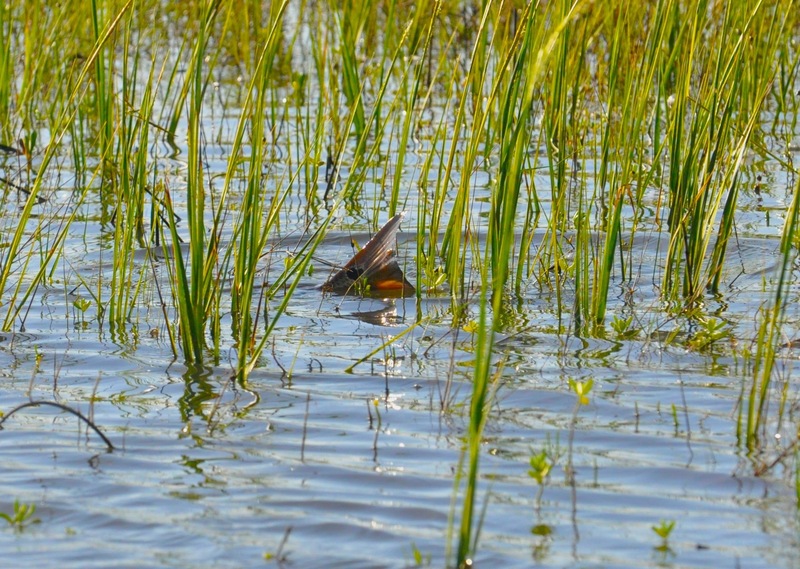 Data provided by the DNR shows the past 5 years have seen red fish spawn success 50% of the long term average. Initial reports indicate 2016 spawn success was the best since 2010. This seems to be supported by the large number of puppy drum being caught. 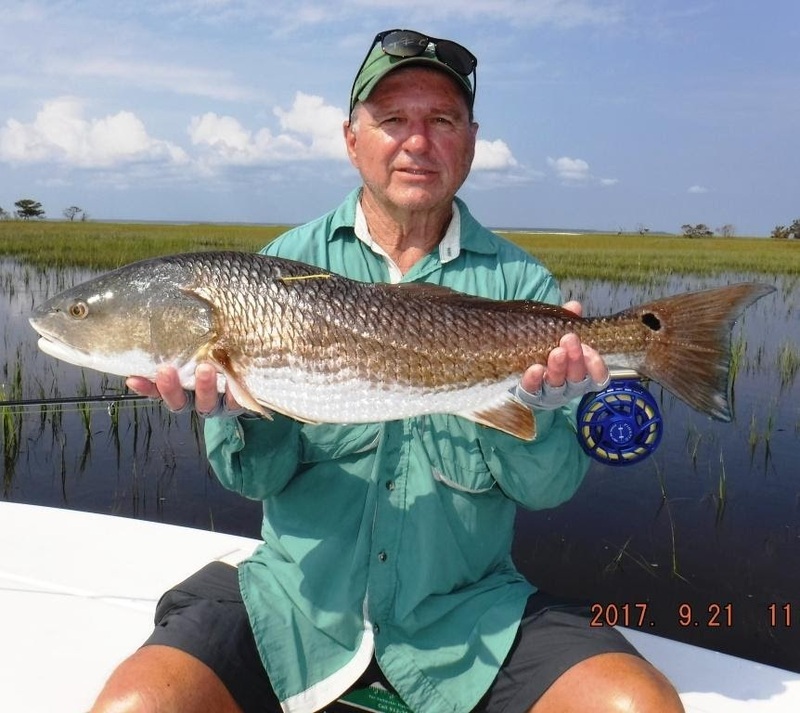 Georgia's red fish limits allow up to 5 fish per angler, per day between 14 and 23 inches. Most states on the East Coast allow 2 fish in a similar slot. I practice catch and release for red fish on my charters, but many charter captains and individuals do not. It looks like red fish numbers may be rebounding. But we all need to do our part; and, if you don't practice catch and release, at least limit your catch. There is no need to keep a 14" red fish. If you must keep some, limit yourself to no more than 2 fish a day between 18" and 23". If you are the boat captain, limit your boat to 4 fish total. Lee Wulff originated the saying that a sport fish in too precious to only be caught once. I wholeheartedly support that statement. Hurricane Irma came roaring through the Golden Isles on September 9, 10 and 11. Pictured above is my house right after we were allowed back onto the island. 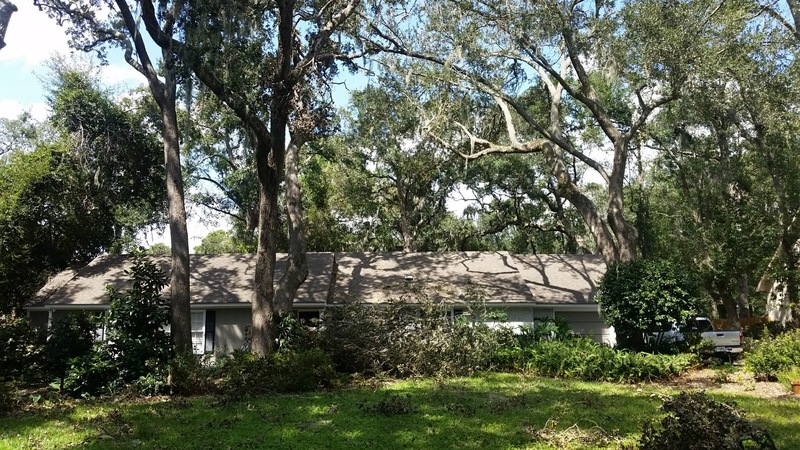 You can hardly see it for the limbs Irma tore off of the oak trees. Fortunately, none of them hit the house. But hundreds of residents were not so lucky. Many suffered wing and major flood damage. The island is back to normal, with a few trucks still picking up debris. We had a lot of fresh water right after the storm, but fishing is strong, just like it is every Fall. The threat of a hurricane is always possible at the coast, but everything this area of Georgia has to offer, makes the risk worthwhile. Light, little and long are the keys to catching schooled up winter time red fish. Winter time red fish are normally found in large schools either on mud flats off of major water ways, or at the back of smaller creeks. In either case, these fish are shallow and in schools for protection. Additionally, the water is much clearer in the winter than warmer months. Sooo all this means is that you have to be VERY stealthy. Since the water is clear, I often lengthen my leaders to 12 to 14 feet. I also lighten the tippet to 12-16 pounds and really like fluorocarbon. Smaller, naturally colored flies seem to work best at this time of year. The St. Simons Scampi, Prawn's Revenge and the shrimp pattern I featured in a past newsletter in size 2 and 4 are my 3 favorite flies for winter fishing. Almost any of the smaller bone fish flies in size 4 to 6 are also suitable. 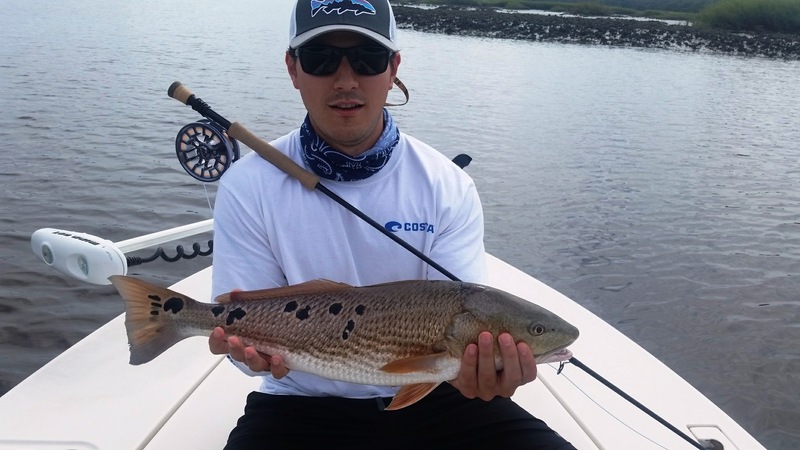 To find winter time red fish, pole around likely areas 2-3 hours on either side of low tide. Look for ripples, pushes and wakes that the schools make as they move around. Do your best to try to get in front of the school. It is much easier to wait and let the school come to you rather than trying to chase one. Always keep an eye out close to the boat for fish. It is inevitable that you will bump and spook fish. When you do, and see the mud puff and rail road like track of mud as they clear out, stop the boat and cast as far as you can to the edge of the school. More than likely, there are more fish farther from you that have not spooked, and you may get a fly in front of one. Limit your false casts and try not to false cast over fish. False casting over fish simply makes the fish disappear. They know something is wrong, and don't spook off. They simply sink down and quietly move away. One false cast is ideal. Check out the description of the PULD cast on my Tips and Techniques page. Make sure you speak softly and do not make noises in the boat. I have had fish spook to normal conversation as far as 30 feet away. Make sure you have on soft soled shoes. 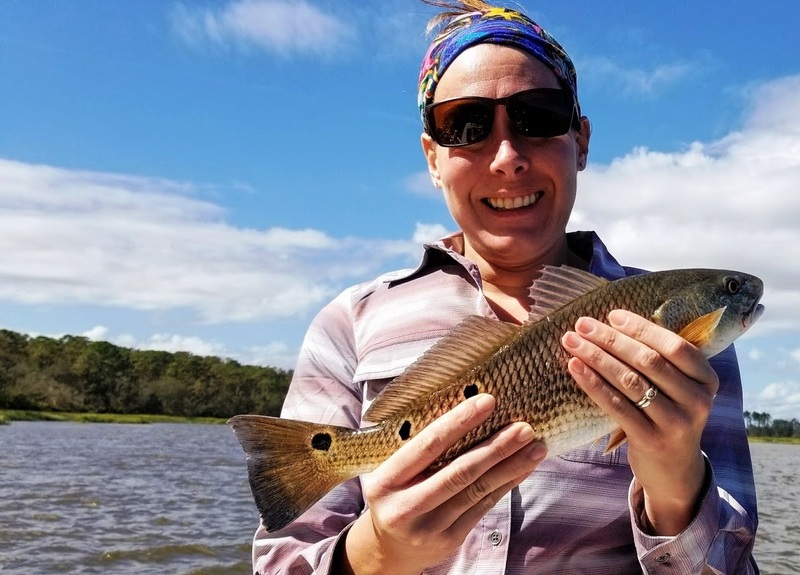 Nothing spooks a red fish faster than clopping around inside a skiff on hard soles. Try to fish the neap tides in the middle of the day. Neap tides mean less water moving and clearer water. On mid day low tides the sun warms the mud and oysters. When the tide comes back in, the water becomes a few degrees warmer, and the fish respond. All there is now is to find them. Get out there in your skiff, kayak, or canoe. Get as skinny as you can, make a great presentation to the fish, and you will be rewarded with a screaming drag and great memories. 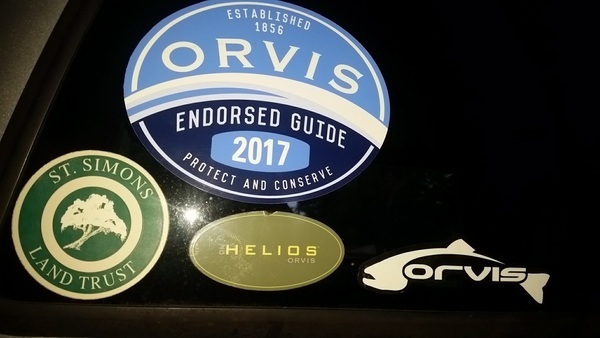 If you see me riding around St. Simons or anywhere else and see my truck, stop me, say hello and let's talk Fly Fishing.